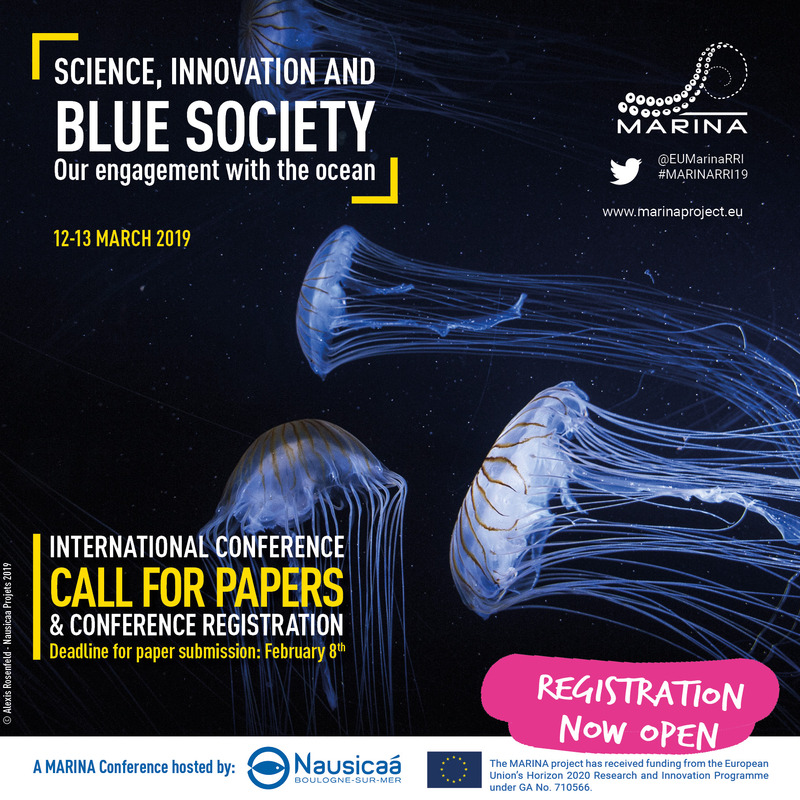 Registrations now open for the Final Conference of the Horizon 2020 MARINA project, focusing on how Science and Innovation in marine sciences can lead to a Blue Society. It will be held on 12 -13 March 2019 at Boulogne sur Mer, in France, hosted by Nausicaa: Europe’s biggest aquarium and French National Sea Centre. Registrations will stay open till the 8th of March. The overall aim of the MARINA conference and project is to stimulate the debate on marine challenges in the RRI community, encourage scientists and societal actors to work together during the whole research and innovation process with a common goal of aligning both the process and its outcomes with the values, needs and expectations of society, and ensuring that marine resources are managed in a sustainable way. The concept of Responsible Research and Innovation (RRI) is part of the Europe 2020 strategy. It promotes a stronger collaboration across disciplines and among scientists, industry, citizens and policy makers in order to enhance the role of society in dealing with current challenges and to make sure that the needs of citizens are integrated into research and innovation. Blue Society is an informed, “ocean-literate” society that benefits from marine vast resources while preserving their environmental integrity and functioning. It relies on Blue Growth and governance of the Ocean, a global common collectively managed across sectors and borders. Education, the effective enforcement of policies, science-informed actions and the development of cross-sector partnerships are its key components. The conference is a unique opportunity to meet, discuss and engage with fellow European researchers and initiatives in an inspiring setting, and to discover the biggest aquarium in Europe. The conference is organised by Nausicaá, National Sea Centre (France) and the Consiglio Nazionale delle Ricerche (Italy) as part of the MARINA Project, funded by the H2020 programme of the European Commission. Delegates also have the unique opportunity to attend a one of a kind cocktail reception in the new exhibition space of Nausicaá after the conference.